In the afternoon session at the EuroHockey Indoor Club Trophy in Dundee, teams were fighting for promotion (Pool C) and fighting to avoid relegation (Pool D). 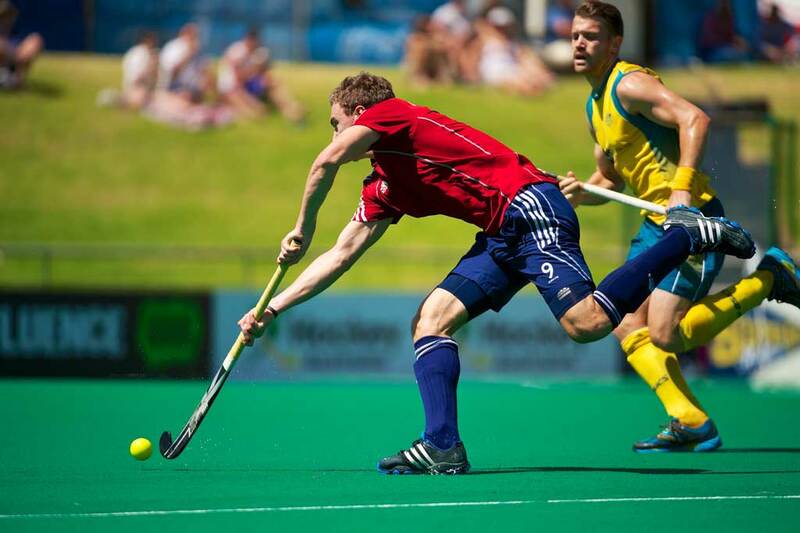 This was the first game in Pool D-the relegation group- and both sides went into without a win .From the first moments it was obvious that they were both out to put this right as Both sides were keen to score and playing attacking hockey. It was Ards who had the first scoring opportunity when after a great Ards attack Chloe Brown’s reverse flick was well saved by Zlomislic in the Mladost goal. The game suddenly became a lot cagier but there was a great chance for Ards on the break but Becky Weir just failed to trap the ball in the D. But it was just a minute later when Ards lead 1 nil after a Chloe Brown field goal in the 13th minute. It was Ards again who had he next chance but they failed to trap the ball at a penalty corner and the opportunity was lost. Mladost then penetrated the D but Ards defended well to clear and they played the ball around the back retaining possession to see the clock out and lead 1-0 at halftime. Mladost began the second half strongly with a great run from the Mladost 15 Petra Dervaric but attack fizzled out with a weak shot. The game then followed the same pattern as the first half. Mladost defending with Ards controlling possession. Ards then had a “goal” chalked off for dangerous lifted ball. Once again the Dervaric caused anxiety for Ards with her stick skills but yet again there was no end product. Both sides were desperate to record their first win and this began showing in this tense contest. However Mladost then had a couple of penalty corners but McKnight made two fine saves. These proved vital as in the 34th minute slick move from Ards Chloe Brown was initially cleared but Harvey followed up to slam home to make it 2-0 Ards. The Croatian coach then took off his keeper to play a kicking back. And a minute later they were back in the mach with a Marijana Franic field goal. Mladost then threw everything into desperate attacks but Ards held on to win one nil. These two teams came very close to qualifying for Pool C and showed why in this match. Highway began strongly and Carmin Dow in the Wanderers goal had a series of good saves from a sequence of penalty corners. Charlotte Watson then had a couple of chances for Dundee but the ball slipped just past the post on both occasions. Both sides were working hard at a furious pace but Wanderers finally broke the deadlock in the 11th minute with a great flick at a penalty corner from Vikki Bunce. The tension was telling as there was green card apiece in the space of a minute. And it was Highway who struck next with an equalising field goal from Ozge Calayir in the 17th minute. But Wanderers took the lead back immediately with another Bunce penalty corner flick. Highway were resilient and immediately went up the court to again equalise through an Ayla Esen field goal just before halftime. 2-2 at halftime but only because of a great save/ clear by Dow in the final seconds of the half . Wanderers seemed to go up a gear in the second half and had al of the possession but Highway looked dangerous on the break.This Wanderers pressure led to penalty corner taken by Bunce which was cleared off the line. But illegally. Bunce took the resultant penalty flick and scored.3-2 Wanderers. Highway went on the attack but Wanderers held out and played it around the back slowing the pace down. There then followed a series of close things at either end. Sangster played a great ball to Bunce who first timed it just past the post. Watson then fed Maxwell who brought out a great save from Zlomislic in the Highway goal. Suddenly the ball was up other end.Penalty corner Highway but saved . All Highway players were now on the edge of their D waiting for a Wanderers error which did not come. With just over 5 minutes left to play Highway pulled their keeper in a last ditch attempt to score. This almost proved successful but Dow made two great saves. With four minutes to go ,after another Dow block on the boards, Kartanovic of Highway received a yellow card.This proved decisive as Wanderers scored from two successive corners, the first from Bunce, the second from Emily Dark, to run out winners 5-2 in this pulsating encounter. This was a tense encounter from the first minute with both sides making mistakes but the other team failing to capitalise on them. Amy Tennant pulling off a good save and Tina Cullen being similarly thwarted by Daire in the Iris goal. However the stalemate was broke when Sally Walton fired in a field goal for Bowdon in the 9th minute. Iris immediately launched a counter attack which led to penalty corner. This was cleared off the line, but illegally. The resultant penalty flick was saved by Tennant with her feet at the right hand post. Iris then had two chances both from open play and a penalty corner but nerves seemed to be getting the better of the French side and neither were taken. Cullen was then fouled on the boards to win Bowdon a penalty corner. Normally ruthless from these set pieces Bowdon uncharacteristically missed. Tina Cullen then had a one on one with the Iris keeper which Daire saved brilliantly. Straight up the other end of the court there was a Great run from Sansonetti and her flick on goal, which Tennant saved again. Bowdon showed their experience by holding ossession and running down the clock until halftime . Halftime Bowdon 1 Iris 0. Iris came close again as Bowdon nervously gave ball away in their D but Bowdon regained possession to break up court to get a penalty corner. But Daire was out like a train to once again deny Walton. Both teams counter attacked at pace and Tennant had another good save. Bowdon then won another penalty corner .This time the ball wa slipped to Cullen but Daire made two great blocks at the top of her D to defy Bowdon again. In the 29th minute Bowdon finally doubled their lead when after a fine run by Holly Hunt, Sally Walton slotted home a penalty corner. Bowdon were comfortable over the next few minutes and the Iris coach took a time out with just over six minutes to go. He withdrew his keeper and they immediately launched a series of attacks. All Bowdon players were defending the edge of their D but Cullen broke up the court to ease the pressure.However Iris broke straight back to win the corner. The ball was transferred and the flick hit a Bowdon foot. Another penalty flick to Iris. This tie the shot was pushed wide of the target.This was to be their final opportunity as Bowdon held on to possession. Tina Cullen got one on one with the kicking back who saved bravely.Right on the final hooter Sally Walton made it the score three nil with a well taken field goal. These two teams topped their pools. The first few minutes of this match were cagey as both sides knew the importance of this game and were understandably cautious. A win would almost certainly guarantee promotion. Rotweiss were the first to break out of this rut of caution and they picked the pace up.They were rewarded for this enterprise with a terrific field goal flick from Stephanie Walti in the 10th minute. But Pingouin were stung into action and gained a penalty corner. This was charged down by the Rotweiss keeper, Flurina Walti, superbly. Rotweiss and Pingouin sparred back and forth until Rotweiss took a time out in the 13th minute. The moment the game began Pingouin pressed much higher up the court and they shot just past the post. In the struggle to clear out,Rotweiss’s Stephanie Walti was hit accidentally by a stick follow through and had to go off to be taken to hospital for stitches. Moments later Pingouin won a penalty corner and Perrocheau scored to make it 1-1 in the 16th minute. Karen Bugmann of Rotweiss was then villain turned hero. After receiving a green card in the 17th minute she put a beautiful flick away from a 19th minute penalty corner to give Rotweiss a 2-1 lead at halftime. As the second half got underway the excitement and intensity built with first a near miss for Rotweiss then Perrocheau clearing off the line for Iris at a penalty corner. It became end to end action but Pingouin had the better chances .The ball was fired into the Rotweiss D but deflected just wide by Huberty. This Pingouin pressure led to a field goal by Valcke after 28 minutes. 2-2. Another rash challenge by Bugmann led to a Pingouin penalty corner which Bugmann then deflected brilliantly and vitally over the bar. It was all Pingouin now as they went all out for the win but Rotweiss were dangerous on the break. And on such a break they won a penalty corner in the 34th minute which was rifled in by Jessica Aebi to make it 3-2 to Rotweiss. Valcke of Pingouin then received a green card and Rotweiss took control forcing two excellent Regulski saves.One at a penalty corner the second in open play. In the final minutes Pingouin attacked but they couldn’t break down the Rotweiss defence. Final score 3-2 to Rotweiss who top Pool C with one more round of games to come tomorrow. In addition we will be tweeting all of the final scores from each venue. 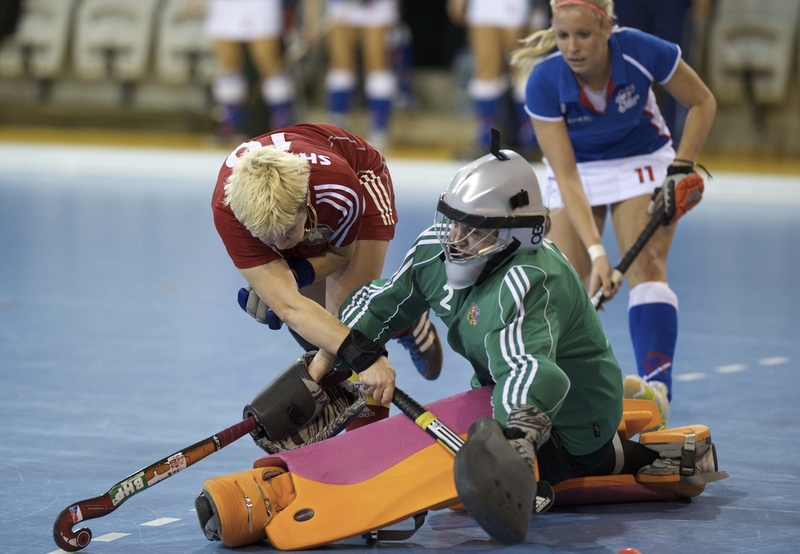 PreviousDay 2 – EuroHockey Indoor Club Champions Cup – Minsk – Finalists are known!